This Sunday was Regan’s 32nd birthday and we initially had a weekend of celebration planned. Lovely dinner date somewhere fancy on Friday, a Saturday of movie-going, mini-adventures and watching the Pacquiao v Mosley fight with friends on TV, and then hosting a Sunday cookout with our parents so that we could celebrate Mother’s Day as well. It looked to be action-packed and celebratory. Unfortunately Regan got sick on Friday and we had to change some of our plans, which isn’t a big deal unless you, like me, promise big things and then don’t come through. For instance, the amazing homemade dinner I promised him on Friday in lieu of going out turned into a frozen pizza instead. I accidentally fell asleep after work (guess who was also sick) and when I woke up at nearly 9 pm, I realized the chicken I’d planned the entire dinner around was actually ground bison. This is what happens when all one’s meat comes packaged in butcher paper and one fails to read the label. Even though I failed epically with Friday night’s dinner, the Rosemary Bread I prepared before I fell asleep turned out just right. We didn’t have the occasion to eat it warmed and dipped in olive oil as planned, but it did serve Regan’s scratchy throat well all weekend in the form of toast with some butter and marmalade. 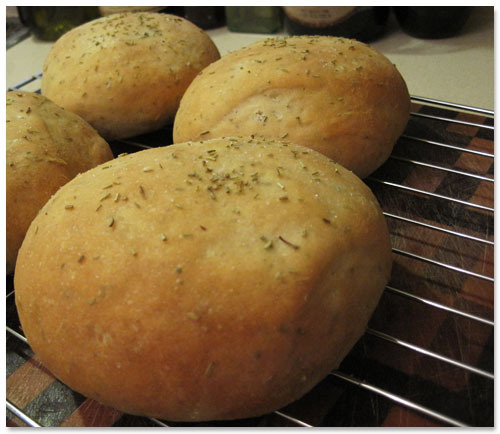 This light, soft bread has a nicely crisp crust. The rosemary and salt make this savory bread perfect dipped in olive oil, topped with bruschetta or turned into garlic bread. 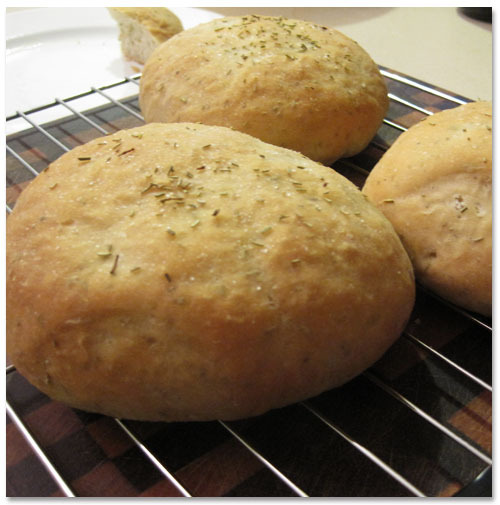 It is based on the Food Network’s, Almost-Famous Rosemary Bread Recipe. I made no modifications to the recipe, but opted for creating the mini loaves by simply rounding the loaves gently with my hands instead of following the process laid out in the recipe. I also found that kneading by hand required much less time than anticipated — about three minutes instead of 10. This recipe will only take about 20 focused minutes of your time. The rest of the time you just get to sit back and let the dough rise. The best part of making bread is that it practically makes itself.